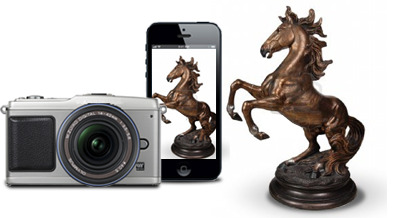 3d Systems is challenging Autodesk’s 123d Capture tool with their new Cubify Capture. The website allows you to upload a set of images, and the server will generate a 3d model from the images. 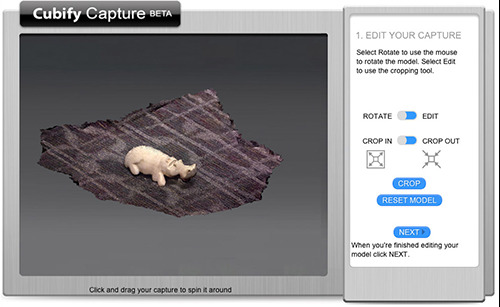 As we said in the 123D Capture review, you’ll have to control how you take your photos carefully to get a good model from them. The process is very similar to 123D Catch, and the results are similar. Take 30-50 images all around the object you want to digitize, and after upload, Cubify Capture will stitch them together. However, Cubify seems more optimized for 3d printing, and in our testing, generates more solid models. We used similar services from Hypr3d, a company recently acquired by 3d Systems, and it seems likely the technology has been influenced by the recent roll-in. One of our testers could not create an account with Cubify, and another said the upload stalled. The new features seem to be slightly buggy, but given 3d Systems, we’d expect them to be cleaned up soon.